The goal of this website is to produce an online, open-access, collaborative critical edition of Sebastian Castellio’s correspondence, starting from this Chronological List of Castellio’s Correspondence. This process will no doubt take several years and will be ongoing, but there are many useful tools at our disposal. First, almost all of the published letters are now in the public domain and available online. Second, the University Library of Basel, which possesses the vast majority of the surviving correspondence, has made manuscript images available online of all of the relevant letters (and many others). Third, the Rotterdam Library and the Bürgerbibliothek in Bern have generously granted permission to make images of most of the remaining manuscripts available online. Sebastian Castellio (1515-1563) was one of the most important Christian humanist thinkers of the sixteenth century and an important early advocate for religious toleration. He was born in Savoy and undertook humanist studies in Lyon. He taught for a few years in Geneva, but his conflicts with John Calvin led him to leave in 1544. From Geneva, he moved to Basel, where he wrote his first works on religious toleration following the execution of Michael Servetus. 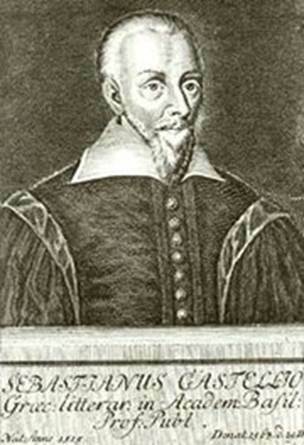 Castellio also clashed with the Calvinists on the subjects of biblical translation and exegesis, as well as on the doctrine of predestination and a variety of other issues. Castellio had many friends, however, and he carried on an extensive correspondence with humanists and admirers all over Europe. Unfortunately, the vast majority of his letters have been lost, but more than two dozen survive, as do more than eighty addressed to him. A few of these letters are published in the Calvini Opera, and his biographer Ferdinand Buisson published many more, but some letters remain unpublished in modern editions, and Buisson published some letters only in excerpts. No critical edition of Castellio’s correspondence has yet been published. 3. Translate the letters into English (and other languages if there is interest). Even before the letters have been critically annotated, this site can be useful for researchers. Available right now is a Chronological List of Castellio’s Correspondence, which links to individual pages for each letter and has a link to a spreadsheet of the correspondence, which can be uploaded into Palladio or other network mapping program. Each letter page presents information about the letter, as well as links to published versions in the public domain and available manuscript images. There is also a Bibliography and List of Abbrevations, with links to public domain versions of almost all of Castellio’s works.